Roberto Luongo backstopped the Canucks to a 2-0 victory against the Wild on Saturday night, marking his third consecutive shutout. Luongo is currently enjoying a run of 201minutes:8 seconds of scoreless hockey. Needless to say, our captain is doing a magnificent job between the pipes these days. Unfortunately, some people out there – most notably the CBC’s Scott Oake – seem to have reached dangerously high Luongo fever. During his post-game interview with Luongo on Saturday night, Oake asked Luongo if this is the best he’s played over a run of games in the NHL. Evidently the sage reporter forgot to review Luongo’s statistics. Indeed, one only need to go back to last yearwhen Luongo held opponents off the score sheet for three consecutive games (check) at home (check) for 212 minutes:12 seconds (over 11 minutes longer). Not to diminish the accomplishment but the current shutout streak is not entirely a new phenomenon in Vancouver. Luongo has demonstrated in his brief Canucks career that when he is at his best and most confident, he is literally unbeatable. Don’t worry though, Scott. Perhaps by next week when the Canucks play the Leafs on Hockey Night in Canada you can put the question to Luongo, again. Although the Canucks nearly squandered a two-goal lead in the second period against the Oilers last night, the awakening of a dormant power play provided the offence required to secure a much needed 6-3 victory over their Northwest division rivals. Having only scored three power play goals all season, the Canucks exploded for four last night. Most importantly, Kyle Wellwood, who utterly dominated the Oilers with the man advantage throughout the game, scored the game-winner early in the third with a great shot to beat Mathieu Garon. Mason Raymond also helped himself to two goals on the power play and Jason Krog the other, late in the third. Apart from the laudable performance by Wellwood and the Canucks power play, rookie Jannik Hansen continued to impress last night, scoring two goals to bring his season tally to three. 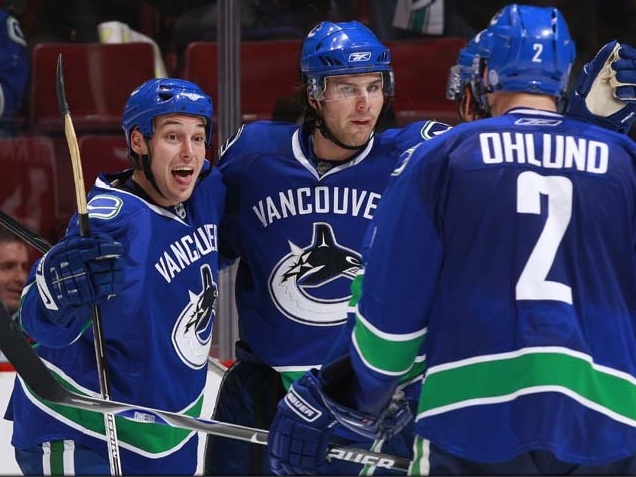 One of the most illuminating bright spots for the Canucks so far has to be the third line of Burrows, Kesler and Hansen. Not only are they superb defensively and all excellent skaters (as expected), they are contributing more than their fair share of offence. Some of the positives aside, I am still baffled by the inconsistency of Roberto Luongo. Sure, he was excellent in the first 30 minutes; and yes, he made a timely save on a Sam Gagner penalty shot late in the second to keep the game tied 3-3. The problem is, Luongo was absolutely brutal on the Oilers’ second goal, completely missing a weak shot with his glove. This goal, most importantly, let the Oilers back in the game after having gone down 3-1 in a short span earlier. Admittedly even the best goalies let in a bad goal from time-to-time but it is worrisome that Luongo seems to be lacking the focus that has come to be a trademark of his play over the years. Now, Luongo did battle back to shut the door with the aforementioned penalty shot-save and a scoreless third period to hold the Canucks’ lead. Still, it must be said that the Canucks are simply not a good enough team to squander two-goal leads – let alone leads of any kind – frequently. Plain and simple, the Canucks will need Luongo to be better. Fortunately, I am confident that he will be. After all, we are only eight games into the season and the Canucks’ captain has never been known as the strongest of starters. Since the last time I was able to sit down to write a proper post, the Canucks have recorded two diametrically opposite results. On the one hand, an impressive, come-from-behind 5-4 victory in Overtime on the road against the Calgary Flames on Saturday night. On the other hand, a dismal effort on the road Monday night against the Washington Capitals, losing 5-1 and recording a paltry 10 shots on goal in the process. Tonight, in a game nationally televised on TSN, the Canucks face the defending Stanley Cup champions. Certainly this is a statement game for the Canucks, especially in light of the embarrassing performance against Washington. The key to the game, from a Canucks standpoint, starts with the captain. Roberto Luongo played poorly against the Caps, conceding 5 goals on 25 shots before his replacement by back-up Curtis Sanford in the third period. Luongo has given up nine goals in the last two games and must get back to his usual self if the Canucks are to stand any chance of winning tonight. The Canucks also need to get some production out of the second line. Taylor Pyatt, in particular, has been a disappointment so far and the line of Pyatt-Demitra-Raymond has contributed only one goal so far this season. 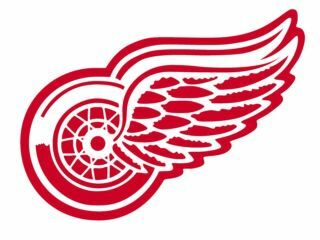 If they can get it together tonight, the Canucks will also stand in good stead in terms of picking up two points at Joe Louis Arena. My prediction: Don’t expect to see Kyle Wellwood back in the lineup tonight. The Canucks’ offence exploded for six goals, while Roberto Luongo stopped 25 shots to record his first shutout of the season, as the ‘Nucks beat the Flames 6-0. Whether Steve Bernier clicked with the Sedins. Bernier scored the second goal of the game and the Sedin’s dominated on the scoresheet (Daniel recorded three points). Bernier also stepped in and fought Dion Phaneuf after the Calgary defenceman levelled Henrik Sedin in the third period. Check. Whether Luongo outplayed Mikka Kiprusoff. 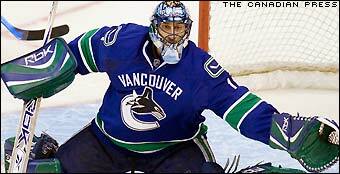 6-0 Canucks – Luongo looked terrific when he was called upon and Kiprusoff looked beleaguered, at best. Check. Whether Todd Bertuzzi would be effective. Bertuzzi recorded zero points, took an interference penalty, and was minus-3 on the night. Just another night at the office, eh Todd? Check. Whether the Canucks would get secondary scoring from the line of Demitra-Raymond-Pyatt. While the Canucks putative second line was held largely off the scoresheet, the third line more than made up for it. Alex Burrows scored twice and Ryan Kesler chipped in with two assists. Replacement check. Okay, I admit it: I’m warming up to the idea. With all necessary caveats in order, I want to take this opportunity (basking in the glow of yet another unbeatable performance) to declare Roberto Luongo as my front-runner for both the Hart Trophy and the Vezina Trophy this season. and, setting aside statistics for a moment, Luongo is the leader of the Canucks. He is one of the first players interviewed by reporters every night, takes losses harder than anyone, and is not afraid to call out either himself or his teammates when necessary. If goalies could be captains, Luongo is probably the only one in the league who would be captain of his team. In short, Luongo is not only the best goaltender in the league this season, he is also the best and most valuable player in the league, given his combined achievements in a wide variety of statistical categories, his contribution to team success, and his intangible qualities as the leader of his team. Instead, I think it is more accurate to identify the Canucks as one of the best teams in the league in large part due to Luongo.